Uno de los pocos lugares donde pasar el día. 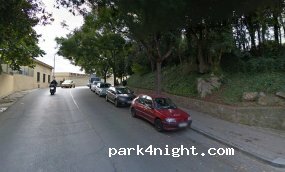 Offiziell laut Straßenschilder ist Kamper Parken verboten. Inoffiziell darf man da tagsüber parken. Wir haben da tagsüber geparkt, sogar ohne Parkticket. Parkticket gibt es nur für 2 Stunden für 5,50€. Wir parkten ab 12 bis 18 Uhr. This entire mountain area is a park and motorhomes are prohibited. It's also a very well known area for motorhome breakins. Talk to the Guardia Urbana (offices just around the corner from the Palau) for clarification. Madness to park here. There is a motorhome parking area right beside the Pompeia Tennis Club for €30pd. Expensive but secure (guarded) and a handy spot to park for city access for a few days. Right near to the Palau and Poble Espanyol. Je vis à côté. La prohibition de stationnement pour camping-car n'est pas légal à l'Espagne. Quelques municipalités abusent de cette restriction. Pour une nuit ce n'est pas un problème. Le vrai problème là c'est le 7% d'inclination. Mais ça c'est à vous ! Ce n'est plus autorisé ! !